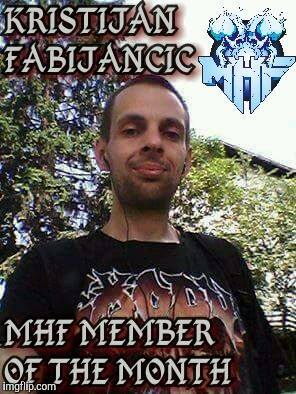 Member of the Month fo r August is Kristijan Kiki Fabijancic. Kris is 35 years old and lives in Croatia, where he works in a factory. He loves music, movies, going to concerts and hanging out with friends. Kris favorite genres are thrash and death, and his favorite bands are Exodus, Slayer, Morbid Angel, Testament and Nile. The title is well deserved. Kris is very active, posting and commenting. No matter his mood, he is always polite and sweet, which makes him a popular and prized member of Metelheads Forever. Congratulations from all of us here in MHF!